Need more Metal Gear? Check out the rest of our coverage or read our review. 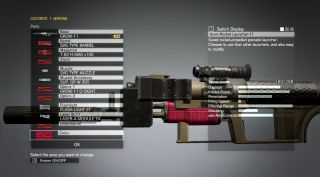 A new bug has been discovered in Metal Gear Solid 5 that lets the player use the weapon customization far beyond its original intent. As demonstrated in the video above, YouTuber jasonLJ adds a 100-round belt and suppressor to a rocket launcher and runs amok, able to fire silent rockets that don't immediately alert enemy guards. You're apparently able to select restricted weapon modules by using LMB instead of enter or spacebar on the PC, hence, the ability to add suppressors to rocket launchers. That said, you can crash your game without following a few steps, outlined in a Reddit thread here. It's a dopey, fun exploit, but players are worried the bug will carry over into the game's FOB multiplayer invasions. Until it's patched out, be wary during invasions. And if the video is any indication, trust no one, especially two-dimensional anime women.